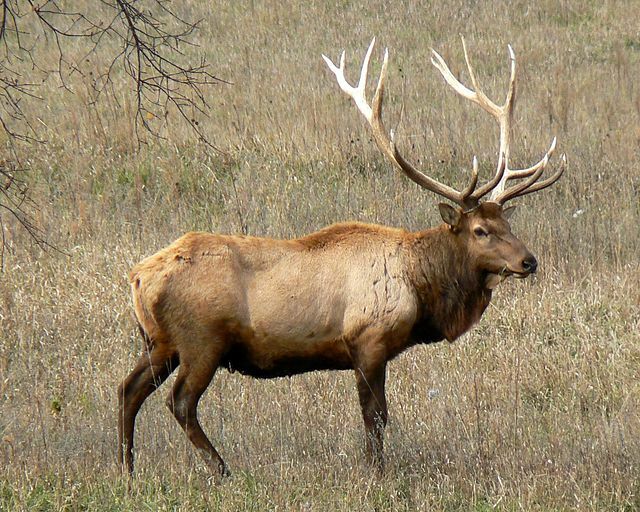 Though probably more identified with the Rocky Mountains and Western United States, Nebraska hosts a population of elk. Elk is one of the largest members of the deer family in the world, and among the biggest land mammals on the continent. Around the turn of the century, Elk disappeared from Nebraska. But in the 1950s and 60s, returned to Nebraska, probably repopulating from Wyoming. In fact, the current statewide elk population is around 3,000 with most of those living in the Pine Ridge area. Elk prefer to live in forest and forest-edge habitat and feed on grasses, plants, leaves, and bark, but are adaptable to other environments as well. Male, or bull elk, are identified by the large antlers which are shed annually. A behavior that attracts much attention from people is the male behaviors during the rut, or mating season, which include bugling, posturing and head on clashes with other males.